The first thing you can do with them is collect them. There are at least a bazillion people online who make and trade artistamps. I have a rather lovely collection of them from Jane Dickinson, who sends me her stamp issues on envelopes, just like real first day covers. I package my faux postage at Ten Two Studios in sheet protectors, ready to be slipped into a binder, for those who are into collecting rather than using their stamps. 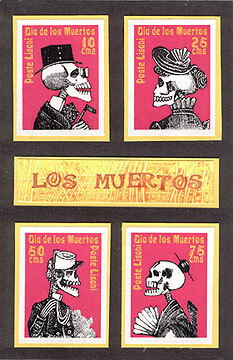 Most faux postage stamps are small enough to use on cards. 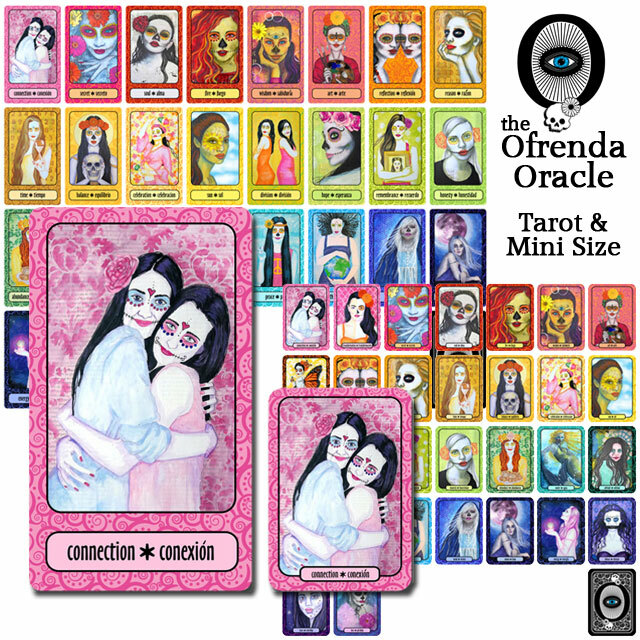 I like to use them in multiples, like I did on the Day of the Dead card shown at right. Doing them in blocks of four, or in strips of three across a wide, short card looks interesting. This is a good way to make an interesting card without spending all afternoon on it. 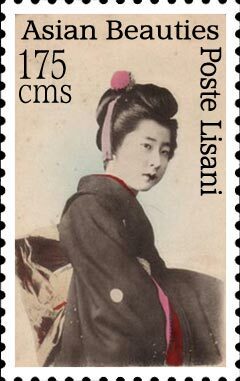 Faux postage stamps are also generally small enough to use on tags. Mine tend to be exactly the right size for regular shipping tags. I like using them like this because it appears that I intentionally created a little piece of framed artwork just for the tag. I get just enough tag around the outside to tie the two pieces together. The tag at left was made in about five minutes—I just swiped it with some Distress Ink, stamped with a script stamp, and then glued my stamp in place. 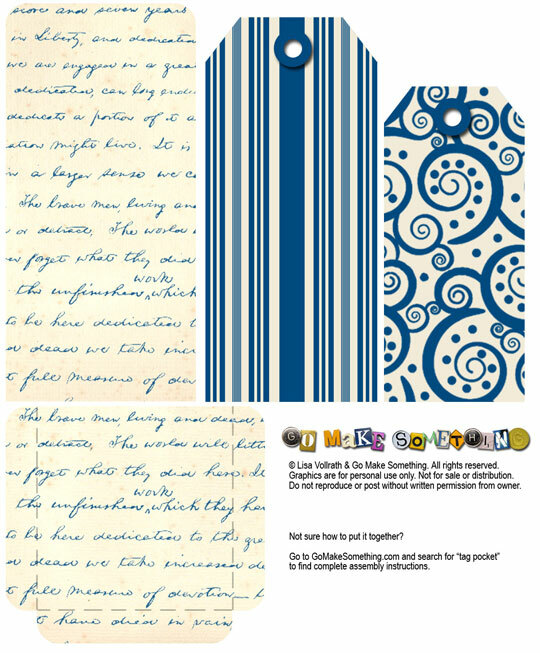 This is a great way to make quick gift tags or bookmarks. You could line these up and do multiples of them in no time at all—and if you’re using one of my faux postage sheets, each stamp can be different, so nobody gets exactly the same tag. Since I mentioned gift tags, there’s a really simple one shown at right, done with a scrap of cardstock, a single stamp, and a piece of gold elastic cord. I like doing little handmade touches like this on gifts. One year, I wrapped all my gifts in white butcher paper, wrapped them with red ribbons, and then did simple handmade gift tags. Everybody commented on how lovely their gifts looked. 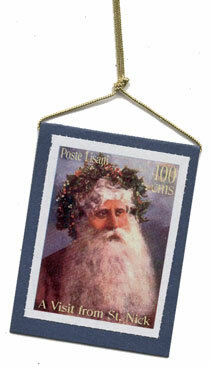 One of the most common uses of faux postage is as envelope decoration. I tend to keep mine far away from the real postage stamps on an envelope, simply because I don’t want to spend all the time decorating one, and then have it returned to sender because my post office doesn’t understand the faux stamp. (My local post office has a history of being confused by mail art.) However, I know quite a few stamp artists who intentionally place their stamps in such a way that they’ll be cancelled along with the real stamps. 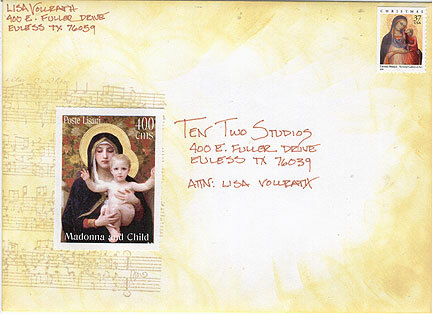 When I was designing my sheet of Madonna stamps, I didn’t realize that the post office had issued a Madonna stamp for Christmas. I really like the way they look together, so this is what my holiday mail looks like. I’ve edged the envelope with chalk inkpads, then stamped some music to one side. Over the top goes a single faux postage stamp, and then I address right above and just to the right. On a couple of my envelopes, I’ve also stamped the word JOY in the lower right corner. This makes the envelope fun and festive, but still doesn’t confuse my local mail carrier. Sometimes, they get a little snippy when artwork gets too close to the postage stamp, makes the addresses more difficult to read, or covers too much of the bottom of the envelope. When in doubt, take it in to the post office and get an opinion before you decorate envelopes for your entire mailing list. 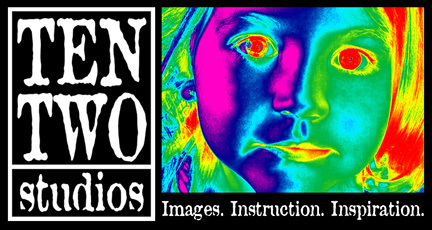 Last, but not least, here’s a deco cover I finished this morning. This could just as well be a card. I simply mounted the faux postage stamp on a piece of decorative paper, and then mounted it again on a piece of corrugated paper that’s been edged with a little chalk ink. The whole thing has been glued to a paint sample card. The whole thing was glued to a piece of folded cardstock to make the cover of the deco. 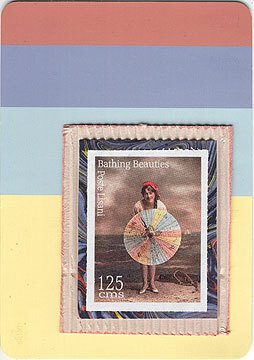 Beyond all these little pieces, faux postage can be used as a piece of ephemera in collage or altered book work. 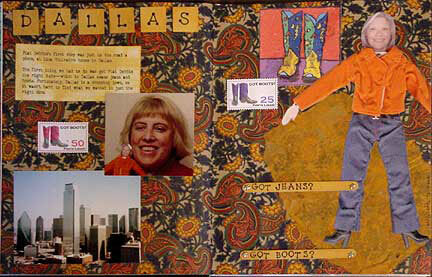 Below is an example of a layout I did in a Flat Stanley round robin, using my own faux postage designs.